The Hevva Cake – or, heavy cake – is a traditional Cornish cake, made simply without leavening or eggs. Associated with the Cornish pilchard industry, its name is associated with the landing of a shoal of fish at which point the huer on the clifftops would cry “hevva, hevva”, the cue for the wives of the fishermen to return home to bake. Perhaps the closest relative to Cornish hevva cake is the Welsh cake. Though Welsh cakes contain a beaten egg, and are slightly different in texture as a result, their flavours are relatively close. The look of the two “cakes” is where they differ greatly. Because hevva cake is essentially a signal of the heavy pilchard nets being pulled aboard, it bears a mark reminiscent of the act. 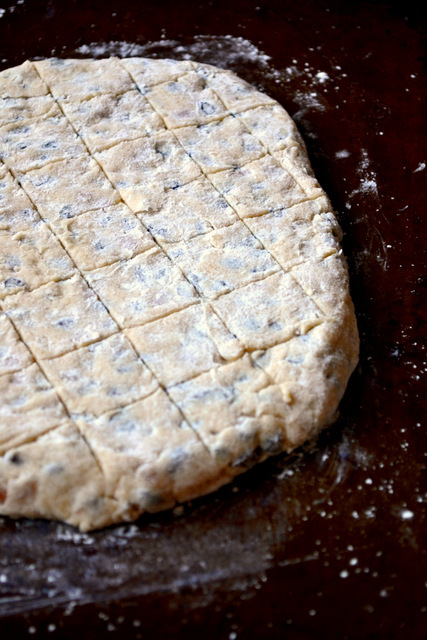 Before baking the raw dough must be scored diagonally is two directions so as to resemble a fishing net. It is this, not the flavour of the cake that makes it truly Cornish. Depending on the recipe you’re using hevva cake contains either butter or lard. Without doubt, lard is the more authentic of the two. Butter, however, conveys rather more flavour than lard and is an ingredient more frequently used elsewhere. Using butter makes for less chance of waste and a better taste all round. Grease a large baking sheet and preheat the oven to 190C/170C(fan). Sift the flour into a large mixing bowl, adding the salt, spices and sugar. Tip in the butter and work the mixture together with your fingers until it resembles fine breadcrumbs. 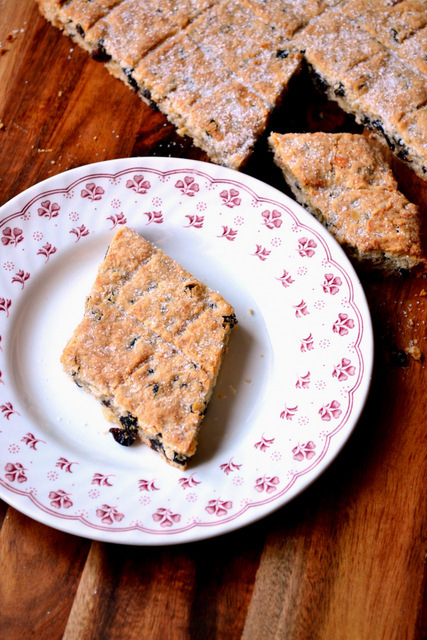 Incorporate the currants and bring the mixture together into a stiff dough with milk – 2 or 3 tbsp should be enough. Transfer the dough onto a well floured surface and roll out until little over 1cm in thickness. Move the rolled out cake onto the prepared baking sheet and score the top so as to resemble a fishing net. Bake for 25-30 minutes until golden brown, sprinkle with a little more sugar and serve warm. Cost: Cornish hevva cake is about as simple as cake gets; it doesn’t even contain eggs. Unsurprisingly, this makes it just about the most frugal cake you could hope for, setting the baker back no more than £1. Thanks for the recipe and the background information! 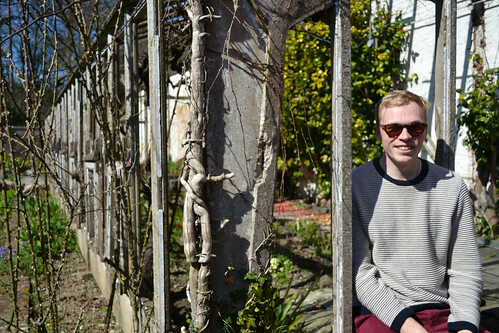 My pleasure – I love the history behind food. Thank you 🙂 – It’s an excellent cake, one that I only found out about recently too. An interesting post, and I reckon that recipe would be great for lunch boxes. Interesting post, especially of the hevva cakes markings that resemble a fishing net. Yes, I found their heritage very interesting indeed. I love the quirks of traditional recipes. I love making English (my heritage) recipes, and I have never heard of this cake! Can’t wait to try it! Please do – it’s a really excellent, simple cake. This looks intriguing, and like it’d be a great afternoon snack. 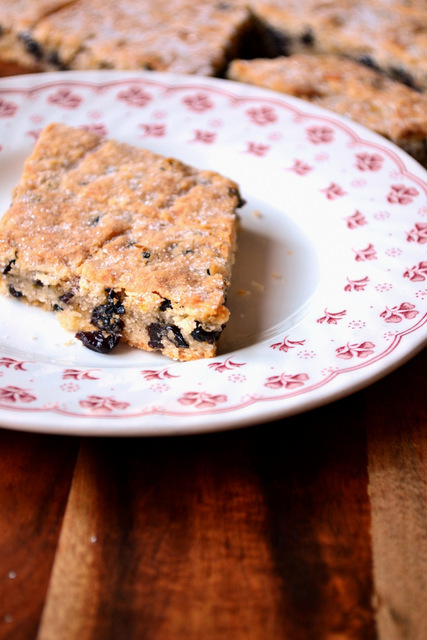 Is it more flapjack-y than cake-y? It’s not really either, definitely not anything like a flapjacks. More like a scone (British). Nick, they look particularly tasty. Again, I suggest, great cycling food. Thank you, Conor. Happy New Year! Thanks! I’ve never heard of this cake. Now I have a new dish for my baking repertoire. It’s very simple, but delicious too. I hope you like it if you give it a go. I have never come across this before, it looks delicious. that looks delicious. i want that now! Me too – it was a really delicious cake. Love true Heritage Food. The Traditions that this is based on makes it even more interesting, thanks for sharing a great recipe & enlightening me to the ‘Cornish Fishing Industry’. Me too – there’s something so interesting about it! I’ll endeavour to try more traditional classics. My pleasure! I saw the post – looks lovely. I know! When I read about it, I had to make it. Glad you like it. Well! 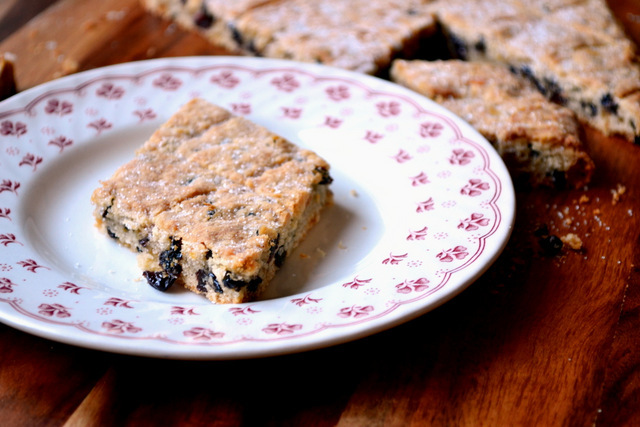 Currants are a great favourite of mine – I look forward to trying your hevva cake. Mine too, I love their flavour.